Deadlines: All registrations must be submitted online 28 days prior to the competition date. All entries registered after the deadline will be charged a 10% late fee per entry. Entries are accepted on a first come first serve basis and will be limited to the performance time available. Late entries will be accepted up to and including the day of competition if time permits. Routines registered on the day of competition will be assessed an additional $20 fee per routine. Changes will be accepted up to 14 days prior to the event. Any changes after that must be made at the event. Changes made after the 14 day cut off will be charged a change fee of $20 per change. Payment: Full payment is required in order for any entry to be accepted and scheduled in a competition lineup. Payments made prior to the event can be made by studio check, cashier’s check, money order, Visa, Mastercard, and American Express. Payments made at the event can be made by cash, credit card, cashier’s check, or money order. Personal checks will not be accepted at any time. Returned checks are subject to a fee of $30 per check. General Information: Studio directors must check the release clause on every entry submitted. Act 1 Talent reserves the right to add additional days of competition, move the competition venue due to unforeseen circumstances, and or cancel the competition if the minimum number of entries has not been met. In the event of a competition cancellation, all entry fees will be refunded. Admission is free for competition participants and viewers. Doors will open at least 30 minutes prior to the start of the competition. Food, drink, and smoking are not permissible in the competition performance area nor anywhere inside the contracted venue area. Good sportsmanship is expected at all Act 1 Talent events from all teachers, directors, dancers, and spectators. Independent registrations are accepted with the approval of their studio. Photo & Video: For the safety of our performers, choreographers, teachers, and parents, the taking of photographs and videos is strictly prohibited during all performances. Photography and videography is also prohibited in the dressing room areas. The use of photography and videography in these areas will result in disqualification and immediate removal from the performance venue. It is the responsibility of studios to inform their participants and their viewers of these rules. As a convenience to participants, professional photographs and videos will be available for purchase. If professional photos & videos are unavailable other arrangements will be made. Photography and videography will be allowed during our classes and awards ceremonies. Tap – Classic Tap technique. Routines may not contain more than 3 gymnastic passes, unless placed in the Acro/Gymnastics category. Improv Routines: must submit a selection of 3 song choices prior to the start of their scheduled session on a labeled USB. Music will be chosen at random by an Act 1 Talent representative. Dancers will not be aware of their song prior to their routine. All songs must meet time requirements. Only soloists may enter the improv category. Dancers must spontaneously create all movement during actual performance. Dancers may not choreograph improv routines prior to their performance. Photogenic: Photogenic entries are accepted. Photogenic entries must be registered and will be required to submit an 8×10 color headshot of the registered contestant. Photos must be labeled with contestants name, registered age, studio and contact email. Submitted headshots will not be returned. Photogenic winners will be announced with solo awards in their age division. One photogenic winner will be selected from each age division. Photos must be turned in at the beginning of competition. Photos submitted late will not be considered. Photogenic entries will receive a critique sheet, available for pick up following their awards ceremony. 4 & under, 5, 6, 7, 8, 9, 10, 11, 12, 13, 14, 15, 16, 17, 18 & Adult. Age of entry is determined by adding all dancers’ ages as of January 1 together, dividing by the number of dancers, and determining the average age. If the average age includes a decimal, drop the decimal for correct placement into Act 1 age divisions. Ages and birth dates must appear on all entries. Overall age group: Mini (5 & under), Petite (6-8), Junior (9-11), Teen (12-14), & Senior (15-18). Contestants will be responsible for showing proof of age to competition directors should a question arise. The placement of performers is at the discretion of the teacher. Suggested for dancers who take 3 hours of class per week or less or have little or no competition experience. Dancers in the Preview level are focusing on basic technique including but not limited to; single pirouettes, basic shuffles and flaps, musicality and rhythm, and performance quality over multiple tricks. Preview level entries are eligible for “Preview” top score overall awards as well as costume, entertainment, choreography and Act 1 Spirit awards. Preview level competitors are not eligible for the Act 1 Elite award. Preview entries can be moved into the next level of competition First Act, if and when the entry’s score qualifies high enough to receive the same placement in the next level of competition. A Preview entry must score 283 or higher to be moved to the First Act level. For more information on our Equal Chance/Bump Rule please see below. Suggested for dancers taking 3-7 hours of dance class per week and have competition experience. Dancers in the First Act level are performing multiple pirouettes, building upon shuffle and flap combinations as well as rhythmic tap concepts, various leap and turn combinations, focusing on transitions and flow of the dance, and an increased performance quality. First Act entries are eligible for “First Act” overall awards as well as costume, entertainment, choreography, Act 1 Spirit, and cash awards. A First Act entry can be moved into the next level of competition “Second Act” if and when the entry’s score qualifies high enough to receive the same placement in the next level of competition. A First Act must score 288 or higher to be moved to the Second Act level. For more information on our Equal Chance/Bump Rule please see below. Suggested for dancers taking 6 or more hours of dance class per week and who have had extensive competition experience. Performers in this category should be focused on expanding their choreographic repertoire as well as exploring the emotional commitment to each piece. Skills should be advanced and should show a solid technical foundation. Second Act entries are eligible for “Second Act” overall awards as well as costume, entertainment, choreography, Act 1 Spirit, Act 1 Elite, and cash awards. Second Act is the highest level of competition at Act 1 Talent. Act 1 Talent is here to provide dancers of all levels and abilities with a positive and fair environment to showcase their talent, hard work, and love of dance. Our Spotlight level is designed for dancers with disabilities. To afford these dancers and their families the same opportunity to share our stage regardless of their age or ability. By joining us at Act 1 Talent we want to enrich the lives of these dancers and encourage them to achieve new possibilities in a fun and safe environment. Spotlight Overall Awards: A Top Overall will be awarded when there are a minimum of 3 routines entered. 1st-3rd Overall will be awarded when 5 or more routines are entered. 1st-5th Overall will be awarded when 10 or more routines are entered. 1st-10th Overall will be awarded when 15 or more routines are entered. We hope you join us in our Spotlight level and dance like EVERYONE is watching! Equal Chance “BUMP” Rule: In order to help provide dancers of all levels with a fair competition experience, Act 1 Talent has created the Equal Chance “BUMP” Rule. Any entry is eligible to be bumped into the next level of competition if that routine scores high enough to receive the highest placement in the next level of competition. For example a “Preview” entry can be bumped into “First Act” if that entry scores high enough to receive a Platinum in “First Act”, scoring a 283 or higher. “First Act” entries are also eligible to be bumped into “Second Act” if they receive a score of 288 or higher, earning them a Platinum in the “Second Act” level. If a soloist has entered more than one solo, all solos will be bumped into the next highest level if any solo scores high enough to be bumped. This rule is based solely on a point system and is not at the discretion of our judges. Dancers are expected to perform in the order of the published program, unless the competition director grants special permission, or a pre-approved change was accepted by the office prior to the start of the competition and it has been put in writing. Any unauthorized delay in the performance schedule will result in a 10 point deduction per judge for the specific entry making the delay. All entries are expected to perform once. Any entries needing to be re-performed on behalf o the performer or teacher are subject to a 3 point deduction per judge. A tentative schedule with performance times of each act will be available online using our “Studio Center” one week prior to the competition. Dancers competing in the first 10 acts should arrive in full costume, including hair and make-up, ready to perform. All other competing dancers must be ready to perform at least one hour prior to their scheduled performance time. If the competition is running ahead of schedule, dancers are expected to perform in order of the program and/or when called upon by the competition announcer. Dancers must check in with our backstage manager a minimum of 3 routines prior to their scheduled entry. If a registered studio or teacher would like to protest a performance for any reason they must do so in writing within 30 minutes of the performance in question. Protest forms are available at the Act 1 Talent registration booth. *Dancers may not compete against themselves. *Overall ties will be broken by the highest technical score. *Contestants will be judged by a panel of judges selected by Act 1 Talent. *All entries agree that the time, manner, and method of judging shall be solely within the discretion of the directors of Act 1 Talent. *All decisions of the judges & directors are final. *Contestants and teachers, by virtue of entering an Act 1 Talent event, give their permission and consent to the directors of Act 1 Talent to use their images, photographs, and videos, within social media, advertisements, electronic media advertising, news, or any other commercial use of our events. *ONLY teachers and performers are allowed backstage. *Dancers may not jump on or off the stage. *For safety reasons, dancers should stay at least 1 foot back from the edge of the marley floor. *For their safety, dancers should never dance off the marley. *Dancers are not allowed to touch or incorporate any part of the ACT 1 TALENT set in their routines, during classes, or at awards. For the safety of the dancers, props are restricted to a maximum height of fifteen feet. Props must be set up and removed within a total time period of five minutes. The use of baby powder, un-weighted helium balloons, glitter, aerosol, gels, water, paint, and anything that would affect the dancing surface, is strictly prohibited; the floor must be in the same condition after each act. The use of live animals, knives, weapons, fire, or fog is strictly prohibited. Special lighting may not be used. Prop storage is limited therefore props must be loaded in and out of the venue on the same day they will be used and cannot be store in the wings or backstage. Anything left on the stage after a routine is the responsibility of that routine to be taken off. Any routine not following the rules set forth will be subject to a deduction of points or disqualification at the director’s discretion. Digital Upload: Upload your music online through your studio account. Music can only be uploaded once registration is submitted. All uploaded music will be assigned routine ID’s by Act 1 Talent. Music must be uploaded 7 days prior to the event. Music not uploaded by this cut off date must be turned in at the event. Studios are responsible to check play back of all routines once uploaded through the online registration system. All uploaded music must be assigned to a routine. Music not assigned will not be available for digital playback at the event. USB: USB’s must have individual music tacks labeled by RoutineID RoutineName – StudioName (i.e. 144 Firework – Katie’s School of Dance). USB’s must be clearly marked with the studio name. CD: All CDs must contain only one song. Individual CD’S must be marked with ROUTINE ID, ROUTINE NAME & STUDIO NAME. CD’S must be submitted in individual CD sleeves. Backup Ipod/Ipad/Iphone: Backup music will be accepted on iPods and iPads. Routines must be labeled with ROUTINE ID, ROUTINE NAME & STUDIO. Music must be individual tracks. All items must be unlocked, on airplane mode & sleep settings must be turned off. iPhones/iPods/iPads will ONLY will be accepted as backup music ONLY. These items must be picked up immediately following your routines performance. Any of these items not picked up will be left at the venue. Categories with 3 or more routines entered will be awarded with a 1st place trophy. Categories containing 10 or more entries will be awarded with 1-3 placements. Categories containing less than three entries will be awarded with medal placements only. Act 1 Elite Award: An entry will receive the Act 1 Elite award if it scores 290-300. Only entries entered in the “2nd Act” level are eligible for the Act 1 Elite Award, or if a “1st Act” level entry advances into the Second Act level scoring 290-300. Preview entries are not eligible for the Act 1 Elite Award. Costume Awards: Awarded to 1 entry per overall age group: 8 & under, 9-11, 12-14, & 15-18. Routines must be entered as a small group, large group, super group, or production in order to receive this award. Most Entertaining: will be awarded to 1 entry per overall age group: 8 & under, 9-11, 12-14, & 15-18. Routines must be entered as a small group, large group, super group, or production in order to receive this award. Choreography Award: will be awarded to 1 entry per overall age group: 8 & under, 9-11, 12-14, & 15-18. Routines must be entered as a small group, large group, super group, or production in order to receive this award. Weekend High Point: Awarded to the highest scoring group routine of the weekend. Must be a small group, large group, super group, or production to be considered, solo’s/duos/trios will are not eligible. Must be registered in our Preview, First Act, or Second Act level to be considered. Will be awarded during the last group routine awards of the weekend. Act 1 Spirit Award: During the final awards ceremony of each regional competition, we will award one studio with our Act 1 Spirit Award. This will be awarded to a studio displaying good sportsmanship, teamwork, positive attitude, and contributing to the overall positive experience received at Act 1 Talent Competitions. This is including but not limited to dancers, teachers, directors, parents, family and friends. Act 1 Spirit Awards will be awarded by an Act 1 Director. Overall Awards: Awarded to the top scoring Solos, Duet/Trio, Groups and Lines in the Preview, First Act, and Second Act levels. Routines must be performed during their scheduled session in order to be eligible for Overall Awards, unless otherwise approved in writing by a Director. Overall Awards will be awarded in Preview, First Act and Second Act levels. Overall Groups will be awarded places 1-10 when there are 10 or more entries entered, 1-5 when over 5 or more entries entered, 1-3 when there are 3 or more entries are entered, and 1 when 2 or less entries are entered. Soloists are only eligible to place once in Overall Awards. Cash Awards: Cash Awards will be awarded to the TOP scoring Solo, Duet/Trio, Small Group, Large Group, Super Group and Production. A minimum of 5 routines must be entered in any given overall category in order for cash prizes to be given. Cash prizes will be awarded in Preview, First Act and Second Act levels. Cash prizes will be given to the registered studio ONLY. All cash prizes can be picked up at the Act 1 Talent booth following your designated awards ceremony or at the end of the event. Unclaimed cash awards will be given in the form of a credit to the registered studios account, valid for one year. *Adult entries are adjudicated only and are not eligible for overall awards, cash prizes, costume, choreography, entertainment or the Act 1 Elite Award. MISS/MR. ACT 1 TITLE: A soloist may enter multiple routines for the regional title Miss/Mr. Act 1. Preview, First Act & Second Act entries are all eligible to compete for title in their age division. Only one Miss Act 1 Talent and one Mr. Act 1 Talent will be awarded per age division. There must be a minimum of two contestants registered for Title per age division in order for the Title division to be held. If only one contestant is received in any age division, the title fee, only, will be refunded. Title divisions will be awarded in the following age categories: Mini Miss/Mr. Act 1 Talent (5 & under), Petite Miss/Mr. Act 1 Talent (6-8), Junior Miss/Mr. Act 1 Talent (9-11), Teen Miss/Mr. Act 1 Talent (12-14), and Senior Miss/Mr. Act 1 Talent (15-18). All previous year regional & national award winners must enter new routines for the following year’s regional competition and national finals. Winning title entries will receive an award and cash award. NEW! Dancers must be registered with a studio and in at least one group routine in order to compete for title. Acceptable group routines include Small Groups, Large Groups, Super Groups or Productions. Duo/Trios do not count as a group routine. Independent entries are not eligible to compete for Title. Dancers must be registered for title prior to competing their Title routine. Critiques & Score Sheets: All scores and judges critiques will be available to the registered studio within one week of the event. All scores and judges critiques can be found in the studios online account. In the case that a video critique is not available, Act 1 Talent will provide a written score sheet. Written score sheets can be picked up at the Act 1 Talent booth after the last awards session for that designated studio. Photogenic entries will receive a written critique and score, available for pickup following their designated award ceremony. 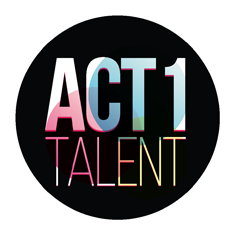 ACT 1 TALENT IS A FAMILY FRIENDLY EVENT: Act 1 Talent strives to provide you with a family friendly event. Inappropriate behavior, language, or content will result in immediate disqualification or a point deduction and will be at the discretion of an Act 1 Talent Director. Please remember we are here to encourage you to continue to grow as performers as well as young adults. Sportsmanlike behavior is expected at all times. All areas of the competition venue are to be left in the same condition they were found. Food and drink are not permitted backstage, in the audience, in the dressing rooms, or any other areas designated by Act 1 Talent. Act 1 Talent reserves the right to excuse any viewers or participants who do not comply. Act 1 Talent reserves the right to refuse service to anyone for any reason deemed appropriate. Act 1 Talent is not responsible for any lost, stolen or damaged items. Act 1 Talent, its promoters, employees, directors, principals and agents are not liable for any injury, damage, or loss that may be caused by any act or omission of them. Any performer competing in dance competitions take certain inherent risks. These include, but are not limited to sprains, bruises, pulled muscles, and or broken bones. Participation in this competition indicates the acceptance of such risks by performers. Therefore by virtue of entering this event, it is agreed that participants will not hold Act 1 Talent, its officers, directors, officials, staff or employees responsible for injuries sustained or illnesses contracted by them while in attendance and/or participation in any activity to an Act 1 Talent event. Act 1 Talent reserves the right to use photo and video footage from each event for promotional purposes including but not limited to printed advertisements, social media and video advertisements indefinitely. Act 1 Talent and the hosting facility are not responsible for personal injury to either contestants or spectators. By registering the official studio representative agrees that he/she has informed all parents, guardians, and guests of all rules & regulations. Act 1 Talent is not responsible for lost or stolen property. Act 1 Talent reserves the right to refuse service to anyone.